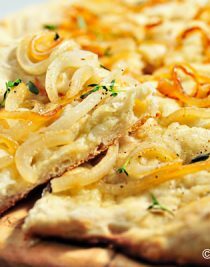 Caramelized Onion and Thyme Flatbread recipe makes a wonderful appetizer or side to a large salad. Caramelized Onion and Thyme Flatbread. Doesn’t the name alone just make your mouth water? This past weekend we celebrated the last day of school with a fun pizza and movie night. Little Buddy chose the pizza toppings and the movie, but I made a quick appetizer to munch on as our pizzas were coming together. I already had plenty of pizza dough rising in bowls on my counter and onions caramelizing to add to the endless topping options I was preparing, so I decided to pull off a portion of the dough for this quick flatbread. At first I answered that although it uses pizza dough, it doesn’t include cheese which is the major difference. He replied that his friend Ben couldn’t eat cheese and ordered cheeseless pizzas all the time. Then, I said that maybe it was because pizzas are usually round and flatbreads are not. He reminded me that my pizzas are rarely ever round and asked if that meant we had been eating flatbreads all this time. It was a lot to consider. Had my pizza-making-life all been wrong? Was I really making flatbread all this time? Or, are flatbreads and pizzas really the same thing after all? 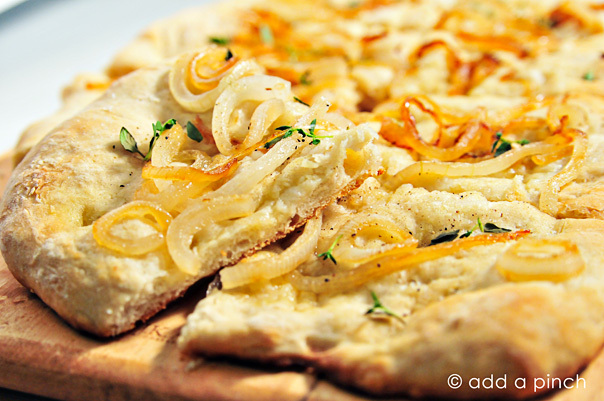 Here’s the recipe for my Caramelized Onion and Thyme Flatbread… errr… Pizza…. err… Flatbread. 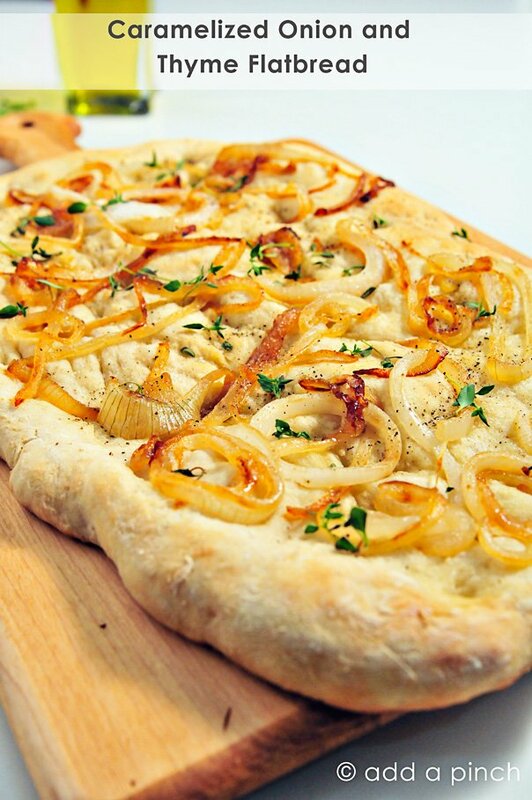 Caramelized Onion and Thyme Flatbread makes a wonderful appetizer or side to a large salad. Prepare pizza dough according to recipe directions. Spread dough onto a baking pan lightly coated with olive oil. Make indentions into dough with finger tips and lightly drizzle crust with olive oil. 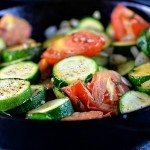 Drizzle olive oil into a large skillet over medium heat. Add onion slices and allow to cook until caramelized and tender, about 10 minutes. Watch onions closely so they do not overbrown. Arrange onions onto pizza dough and bake for 15-20 minutes until golden brown. Remove from oven and immediately top with fresh thyme leaves that have been removed from the stem. Sprinkle with salt and pepper, slice, and serve warm. To reduce time, you can prepare pizza dough and store in an airtight container in the refrigerator for a few days until ready to use. Additionally, you could use prepared pizza dough purchased at your grocery store. 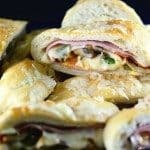 I’d love to know what you think on this flatbread versus pizza discussion. I want to eat this whole thing… like pizza! Thanks so much, Lori. I hope RecipeBoy had a great birthday! Whether you call it flatbread or pizza, I want a piece…or two… The flavors sound absolutely fantastic in this, Robyn! Thanks so much, Dara. The combination of flavors is definitely one of my favorites. Thanks so much, Aggie. I could eat it every day, too. The onion is perfection and with the thyme? Mercy! well, whatever you call it, I want it…NOW! Looks amazing, Robyn!!! I just love you, Bridget! I wish you were closer and I’d make one just for you! Looks SO good. I can’t wait to share this one with my family. Thanks Marly. I can’t wait to hear how they like it! Oh Robyn, Now I’ve gotta go check the freezer for pizza dough. Here’s hoping…. I hope you found pizza dough in the freezer. 🙂 We could just meet halfway and you bring me some of that bread pudding and I’ll bring you some of this flatbread. Deal? That means the world coming from you, Amanda. Thanks! Oh man does this look good! Pizza…flatbread…I don’t care what it’s called, I just want it in my mouth. Thanks, Katie. I know you’ll be excited after the move to settle into your new kitchen! What a gorgeous flatbread, Robyn! I bet the aroma of it baking was just fabulous! Thanks for sharing. Also, I’m having a ChicWrap giveaway today that you should enter! Thanks, Georgia. It does smell heavenly cooking! I loooove how simple this is! So delicious! 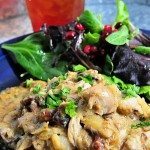 I love caramelized onions and I love thyme…this is right up my alley. I bet it would be great with bacon too! Oh my goodness, Rachel. You are so speaking my language with the addition of bacon! YUM! I’ve often debated the difference between flatbreads and pizzas… And, then there are those restaurant menus that have “flatbread pizzas”… Hmmm, redundant? Anyway, whatever you call it, this looks absolutely fabulous. 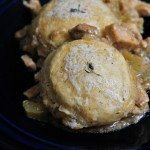 Love the pairing of caramelized onion and thyme! Thanks so much, Jen. That does sound a bit redundant, doesn’t it. I’m with you though, whatever it should be called, I love it! I could dive into that mouth open right now!!!! Thanks so much, Wendy. It always disappears in a flash! I always thought flatbread was different because the ingredients were different. The texture of the bread always seemed different than pizza crust. I like both though! Always. And yes!! 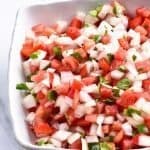 Your title completely made my mouth water! Thanks so much, Leigh. You may be on to something! Good question! I’ve often wondered the difference between pizza and flatbread as well. I’m a bit perplexed and the more I read, the more I can’t find an answer! So glad I’m not the only one that doesn’t know! I don’t care what it’s called when it has caramelized onions on top, lol! Gorgeous – the crust, the onions, all of it! pizza or flatbread… who cares as long as it’s tasty right? I love this flatbread, the flavors are amazing! Again, you make me hungry. Now I want to have a pizza party, except I want this one all to myself. 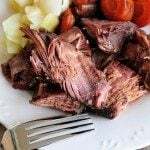 Great looking recipe!!! I can almost taste it now….yummy! Here is a good definition of flatbread vs pizza…..Flatbreads are breads that are flat. All pizzas are flatbread, but not all flatbreads are pizzas. Flatbreads can encompass Jewish Matzo, Indian Naan. Greek Pita, Mexican Tortilla, and such! Whatever, I can’t wait to make this, so thanks for a wonderful recipe!!!! Hmm, I thought flat breads were cheese-less pizzas 🙂 Your recipe looks delicious! I love the flavor of caramelized onions. I just love these pizzas. Oh my..This looks yummy. I get a carmelized onion/bacon flatbread at carrabbas and my hubby and I eat it in no time. I can’t wait to try this!